A Cutting Edge Independent Publisher, Pro Se Productions introduces another groundbreaking imprint, one aimed at the future fans of Genre Fiction and New Pulp. From the Creative Mind of Fantasy and Pulp Author Nancy A. Hansen comes COMPANION DRAGONS TALES VOLUME ONE, the first volume in Pro Se’s newest line of top quality fiction! COMPANION DRAGONS TALES VOLUME ONE: A FAMILIAR NAME marks the debut of a new universe of action and excitement created by Hansen and authors Lee Houston, Jr. and Roger Stegman. Nancy A. Hansen (Fortune’s Pawn, Prophecy’s Gambit) brings her top notch, beloved Fantasy style to a tale full of magic and wonder as well as its own brand of action and adventure. 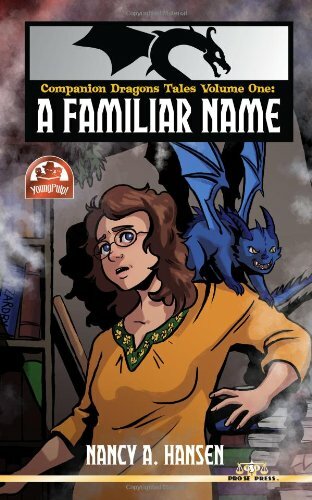 In A FAMILIAR NAME, the first volume of COMPANION DRAGONS TALES, Nancy Bittergreen is a busy author. She's also a witch who regularly travels to the wondrous worlds brought to life by magical writing. A dangerous occupation to say the least. Nancy decides she needs a familiar- a small, intelligent creature who can be trusted to watch over things while she's gone or come to her rescue when situations get just a little too weird. The very best familiars are miniature dragons, but they come with a high price and no instructions. Unfortunately there are powerful people who would prefer all magical creatures be registered, regulated, or even eliminated! Bringing a familiar home with her becomes a race against time with a dangerous opponent as this middle aged witch has to find out her new companion's true name before sunrise turns him to stone. COMPANION DRAGONS TALES VOLUME ONE: A FAMILIAR NAME introduces Pro Se Productions Young Reader Imprint- YoungPulp! Aimed at introducing younger audiences to the style of Pulp Fiction while providing them with engaging tales, YoungPulp features stories from all genres written both appropriately and intelligently for Young Readers to discover, enjoy, and explore! Written with intelligence and style that adults can appreciate as well, YoungPulp aims to add to the growing numbers of Genre Fiction and New Pulp Fans with tales that excite and appeal to pre teen and adolescent readers. This fantastic volume features beautiful cover art by Heidi Black as well as format and print design by Sean Ali and Ebook formatting by Russ Anderson. COMPANION DRAGONS TALES VOLUME ONE: A FAMILIAR NAME is available in print on Amazon at http://tinyurl.com/mfaclyn and via Barnes and Noble at http://tinyurl.com/lhqvj7f for $9.00. Also available for only $2.99 as an Ebook for the Kindle at http://tinyurl.com/lufo8t9, on the Nook at http://tinyurl.com/llolll7, and in multiple formats at http://www.smashwords.com/books/view/342885. See a side of magic, action, and fun that has never been seen before as Pro Se's YoungPulp and Nancy A. Hansen bring you COMPANION DRAGONS TALES VOLUME ONE: A FAMILIAR NAME! For interviews, review copies, or further information, please contact Morgan Minor, Director of Corporate Operations at MorganMinorProSe@yahoo.com. For more information on Pro Se Productions, go to www.prose-press.com. And stay tuned for further releases concerning YoungPulp.